Stephen Gudeman is a Series Editor for Berghahn’s Max Planck Studies in Anthropology and Economy Series. Below, he answers our questions about his work. Working with Chris Hann, you have started a new Series with Berghahn Books exploring the connection between economics and anthropology: Max Planck Studies in Anthropology and Economy. Can you explain what we may learn covering this ground? How can anthropology help the study of economics, which is generally a quantitative discipline? Chris and I are interested in the connection between social relationships and material life. The writings of Karl Polanyi have influenced both of us. Chris first worked in Hungary, Polanyi’s birthplace, and I came to Polanyi after passage through business school and some exposure to standard economics. Polanyi explored the relation between economy and society, which is very relevant today given the spread of capitalism and the questioning of its effects. Both of us are open to multiple approaches to economy, including quantitative methods, but with this series we want to create a space for examining economy in relation to society. The first volume in our series expands this space by looking at ritual in relation to economy. The second volume considers the house economy in relation to markets. We support ethnographic work that engages this critical intersection in all economies but receives little attention in standard economics. Your first two volumes collect essays on post socialism in particular regions – what drew you and your contributors to this part of the world? Chris is a founding Director of the Max Planck Institute in Halle (formerly in East Germany), which was established after reunification. His Department has particularly focused on regions in Eurasia that became open to anthropological research after 1989. My ethnographic work on economy was undertaken in rural Latin America, but it proved to be a useful background for research in this region. When we started, a comparative study of the “transition” from central planning to markets was ripe for attention. Our contributors were post-PhD’s, who had already worked in the general area but not on our topics. We wanted to explore our themes and reintroduce the value of anthropology’s comparative vision. In the current US Presidential campaign, we have been hearing talk of the “socialist” policies of Bernie Sanders. This seems new for national campaigns in our capitalist country. Do you have any comment on this? Is there potential for ethnographies in the US and North America along the lines of research? In the United States, the mentality of the market has grown so dominant that studies of economic practices “outside” the market have difficulty gaining intellectual foothold. The United States has many “socialist” policies, such as social security, the Affordable Care Act, and Medicare, but many Americans shy from using the word, socialism, except for Bernie Sanders. For Sanders, socialism seems to mean expanded welfare and greater economic equality established through taxation. He does not promote central planning and principally argues for reining in Wall Street, big banks, and other monopolies, as did President Theodore Roosevelt a century ago. Unlike our studies, which provide an enlarged vision of what economy means, Sanders does not see the house as an “economic” institution nor envisage the way other social forms, such as ritual and religion, are integrally related to the functioning of all economic life. Our studies–and more–should be carried out everywhere the market dominates, as in North America. What sort of proposals would you welcome for the Series? Is there a certain kind of author or scholar you’d like to hear from? We welcome ethnographic studies that respond to the relation of economy and society. They can be comparative or focused on a single area, and they may pertain to rural or urban situations. They should have a theoretical component that places the work intellectually, while demonstrating originality. They should be well written and reader friendly. We want to reach a broad audience stretching from anthropology, to economics, to the other social sciences. Authors should have maturity of mind, which is not necessarily correlated with age. Are there certain essays in the two collections published so far that you recommend for the social scientist or researcher new to your work? I recommend the two Introductions by Hann and myself as starting places. We present each topic, the history of the theory and the areas, as well as introductions to each of the essays. The reader can then choose where to begin reading. How would you summarize the mention of the Series in just a few sentences? The Max Planck Series welcomes ethnographically based studies that have a theoretical grounding in the relation of society and economy. How does your work contribute to the ongoing discussion of income inequality? What does Piketty’s recent book Capital in the 21st Century–talked and written about at great length–offer to anthropologists? I wrote a lengthy review of Piketty’s book for Anthropological Forum. It had 4000 hits in one month. Some of its origins can be found in our two volumes that were in press. Piketty’s finding that in the long run the rate of return on capital exceeds an economy’s growth fascinated me. It shows that inequality persists in capitalism unless controlled by social policies. My two departures from Piketty (with which he agreed) were that he was unclear whether markets are “perfect” or “imperfect,” and he did not take account of the way social institutions outside markets, through rent taking, lead to the inequality he describes. Our studies illustrate that a focus on markets alone provides an incomplete understanding of how real economies work both culturally and through institutions from ritual formulations, to the house, to state policies, to the social relationships that support material life. The studies help show why inequality persists in capitalism, whether markets are perfect or imperfect. Stephen Gudeman is Professor of Anthropology at the University of Minnesota and was formerly co-director of the Economy and Ritual project at the Max Planck Institute for Social Anthropology in Halle. 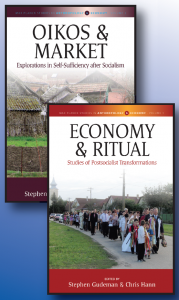 His most recent publications are Economic Persuasions (2009) and Economy and Ritual: Studies in Postsocialist Transformations (co-edited with Chris Hann, 2015). Chris Hann is a Founding Director of the Max Planck Institute for Social Anthropology at Halle. He formerly taught anthropology at the Universities of Cambridge and Kent. Hann is co-author of Economic Anthropology. History, Ethnography, Critique (2011) and co-editor of Market and Society: The Great Transformation Today (2009), both with Keith Hart.